The Thunderbird Lodge estate is one of the best examples of a historic “Tahoe society” estate and a 6-acre historic district listed in the National Register of Historic Places, which is surrounded by over 40,000 acres of Forest Service and Nevada State Parks land. 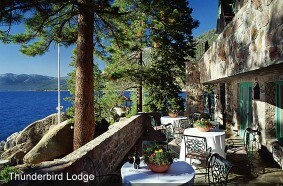 Previously known as the Whittell Estate you will find the Thunderbird Lodge located on Lake Tahoe’s east side. Attend one of the tours are available May through October. Call for details. You won’t find a more enchanting or memorable location for your wedding than the historic Thunderbird Lodge. The waterfront gazebo and the secluded patios connected by stone pathways provide special gathering places for the enjoyment of your wedding guests. The Lighthouse Room, Conference Room, and the serene lakeside lawn are the perfect location for your special seated dinner and sunset dancing.